A 65-meter long rectangular room with dark wooden barrel ceiling, walls covered by double story bookcases containing an incredible collection of 200.000 tomes; elaborate cast iron staircases daring the reader to venture to its highest recesses and two lines of sculpted busts marking the library recesses with their white marble stare. If such a description sounds familiar to you, I bet it is because of one of the two following reasons: a great photographic memory of the Jedi temple archives, as they appear in Star wars episode 2, or a childhood memory of a school tour to one of Dublin‘ s main attractions: the Long Room at Trinity College. 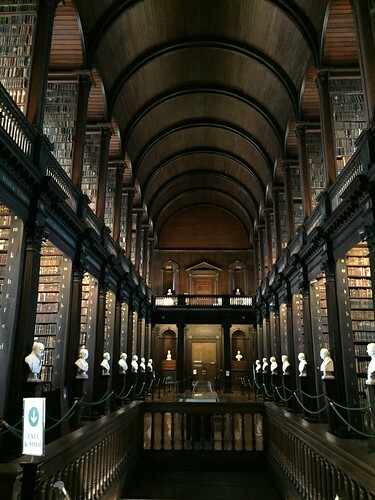 As unconnected as these two things may sound, the Jedi temple archive and the main room of Dublin’s Trinity College Old Library do have something in common: they bear a startling resemblance to each other. I don’t believe I have permission to post the picture from the saga, but you can have a look here and tell me what you think! The similarities between the two rooms are said to be down to chance, but when the new star wars film came out, over Christmas, I couldn’t help but remembering this coincidence and decided a visit to the Trinity College library was well overdue. Star wars episode VII tickets in hand, I took a detour on my way to the cinema and entered the Long Room. The Long Room is the most imposing and beautiful part of the vast Trinity College Library, an impressive collection of over 3 million manuscripts and books hosted in the grounds of Dublin’s oldest university. 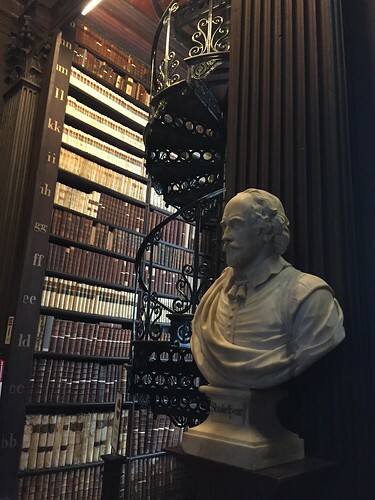 Trinity college dates back to 1592 when it was funded by charter of Queen Elisabeth, but the oldest library buildings we see now only date back to 1712, when construction started following the designs of Thomas Burgh. Since then, the library has hosted important historical manuscripts from medieval to modern times: in 1801 it acquired the right to claim a free copy any new book published in Ireland and the UK, making it quickly one of the largest collections of manuscripts and books in the country. The long room contains many treasures, including Ireland’s oldest harp and the proclamation of Irish independence, but it is probably best known because of the medieval manuscript ‘the book of Kells’. The book of Kells is a precious manuscript dating back, probably, to the 9th-century a.D. Made of vellum (prepared calfskin) the book contains the Latin version of the 4 gospel prefaced by other texts, including “canon tables”, or concordances of Gospel passages common to two or more of the evangelists; summaries of the gospel narratives (Breves causae); and prefaces characterizing the evangelists (Argumenta). The book measures approximately 330 x 255 mm and is made of 340 folios: its most impressive feature, in term so of aesthetics, is the elaborate writing in which the gospels are committed to paper. Each page of the book is lavishly decorated with abstract designs and images of plant, animal and human ornament, each image carefully selected for its symbolic value and its ability to glorifying Jesus’ life and message. The book is in a protective case and photographs are not allowed, but postcards and posters with details of it are for sale: the picture below is of one of these reproductions and gives a first idea of the level of mastery involved in such a beautiful writing. 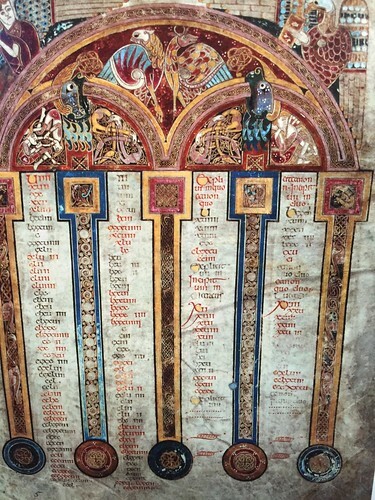 Mystery surrounds the exact origin of the book of kells but the book is surely monastic in origin. Since the VII century Ireland has been the centre of a thriving monastic culture: the monks lived in communities devoted to the study of the scriptures and to manual work and part of this manual work consisted in the writing and therefore conservation of the word of the gospel. The main monastery at the time was located on the island of Iona, founded by St Colum Cille, and historians believe that the book of kells was at least partially written in that location sometime. In 806 a.D. Iona was attacked y the Vikings and the book sis said to have been brought to Kells, near Dublin, for protection: it is only in 1661 that the book fund his home in Trinity College. The book of Kells and the long room are one of the most popular attractions in Dublin so prepare for long lines! The tickets can be bought on location (the till is located in the souvenir shop, just beside the library entrance) or online and give access to both the book of Kells and the long room, located on the floor above. The book of Kells is difficult to appreciate for little children and despite our best efforts, we fond ourselves being rushed in our visit by the presence of our two preschoolers, who only really got excited once we reached the impressive long room. A more suitable company for this kind of exhibition is certainly children of school age: the exhibition caters well for them and teachers and parents can also download age specific worksheet to make the visit more interesting and interactive. This review is unsolicited and unbiased and I received no compensation for it. Opinions are, as always, my own.